Years ago, after a devastating house fire, our family of six was housed in a motel prior to being relocated to a temporary home. I found that I could turn out great meals using a toaster, microwave, electric skillet and a few utensils. Although I prefer a well appointed kitchen environment, many gadgets, appliances and expensive cookware are not so very necessary to get the job done. Even though I am no longer the time-deprived young mother of four children, I love to find better tools and clever solutions for one of my favorite pastimes, cooking. Many years ago, I attended a cooking class held in a gourmet-products store. The store featured a beautiful working kitchen and it became the focal point where guest chefs taught interesting and varied classes. The fragrances inside the store were wonderful! In the class, I recall the skillful way the chef used knives. He stressed that we should never use a dull knife for anything except to spread butter or soft cheese. Of course, he was being facetious, but we got the point. That class is also where I was introduced to freshly ground nutmeg - quite a delightful surprise. The lesson ended with the creation of a superb dessert - a French-inspired apple pastry called Apple Tarte Tatin. (pronounced tart tatan). The pastry was baked in a skillet with the crust draped over the apple filling. 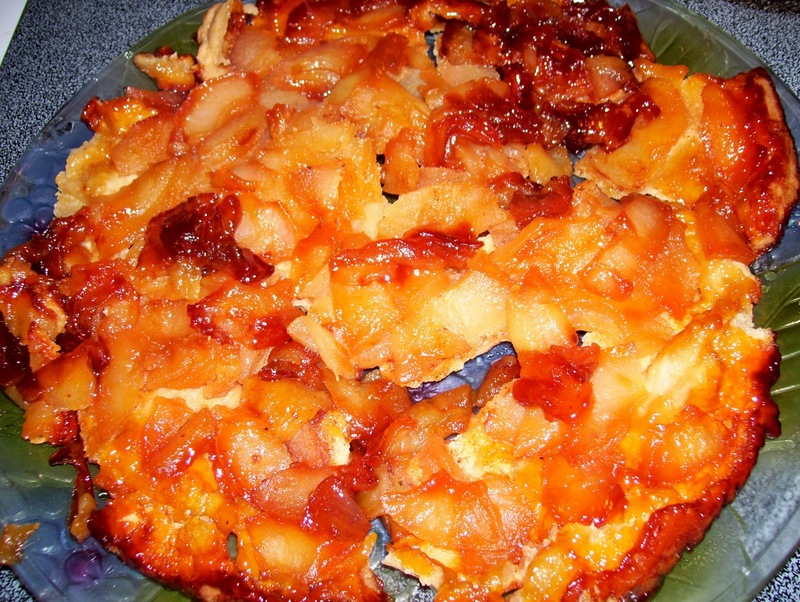 After being baked to a golden brown, the Apple Tarte Tatin was inverted onto a serving plate. This unusual dessert crust is perfect for the amateur - it can look horrible and it won't matter...it winds up on the bottom! Because of the layering process, the pie crust becomes infused with wonderful buttery flavors and remains flaky and crisp - everything a pastry crust should be. 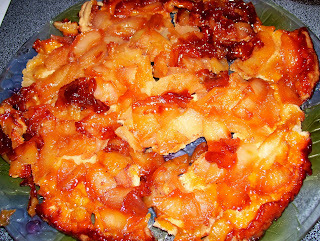 Because the caramelized layer clings to the crust edges, the taste and texture is amazing! Mix 1 C flour and 2 T sugar. 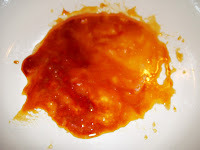 Add butter or margarine cut into very small pieces. Add yolk and salt. Work the fat into the flour and egg mixture very quickly with your fingers or a heavy fork. If the dough is too stiff, add a bit of cold water, a tablespoon at a time. Work it in and see if it forms a ball without breaking. Put in the refrigerator for 1 hour or longer. In a heavy, oven-proof skillet, brown ½ cup sugar. 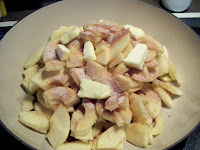 Arrange the cut apples in a mound on the browned sugar. Sprinkle with 2-3 T sugar mixed with a little nutmeg and cinnamon and dot with 4-6 T butter. 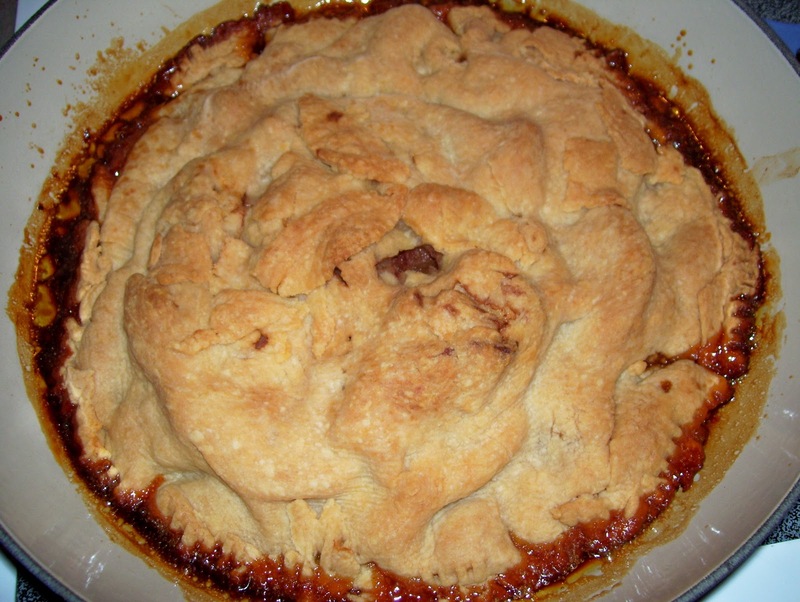 (Even if you use margarine for the basic crust, by dotting the apples with real butter, the end product will be infused with wonderful buttery flavor). 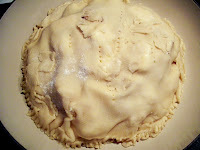 Roll out pastry to cover the apples. Trim excess dough and use to patch any tears. Use a fork to even out the crust edges against the bottom of the pan. Vent top of crust with a fork. Bake at 350 degrees for 1 hour, cover lightly with foil and bake for 30 more minutes. When pastry is done remove it from the oven and invert onto a serving plate. 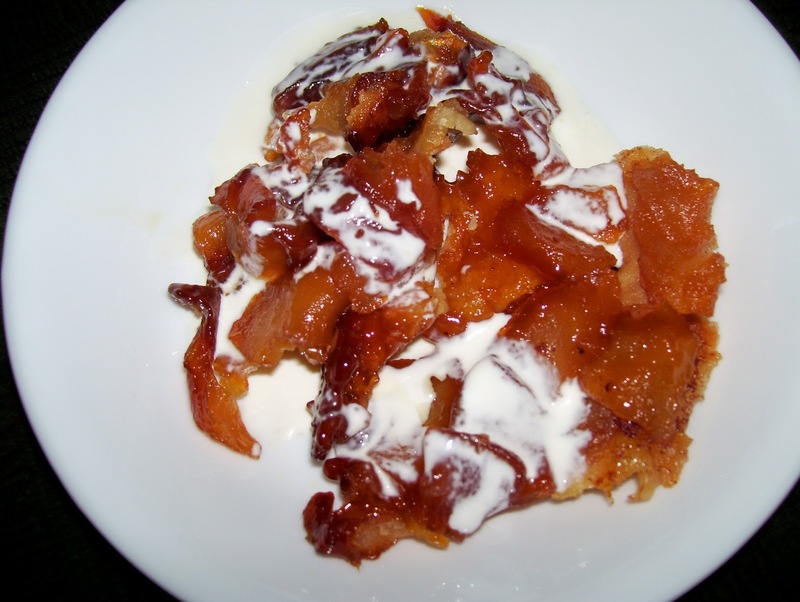 Serve slices with heavy cream or ice cream.